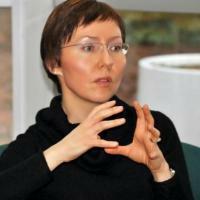 Anna Krylova is Associate Professor of Modern Russian History at Duke University. She works on twentieth-century Russia and the challenges posed in envisioning and building a socialist alternative in the age of industrial and post-industrial modernity and globalization. Questions of historical theory and gender theory propel her work on contemporary historiography. She is the author of Soviet Women in Combat: A History of Violence on the Eastern Front (Cambridge University Press, 2010) which was awarded the 2011 Herbert Baxter Adams Prize of the American Historical Association. Her second book project, provisionally titled Imagining Socialism in the Soviet Century, aims to make possible a new cultural history of Soviet Russia by historicizing the ways in which normative conceptions of socialist society, sociality and individuality evolved in Russia from the Revolution of 1905 to Gorbachev’s half-decade of perestroika. She is also preparing a historiographical manuscript, The Practice of History in the Twenty-First Century, featuring essays accessing of what has happened to the practice of history after the theoretical and epistemological turmoil of the 1980s-1990s. Most recently, she has participated in an AHR Conversation “History after the End of History: Re-conceptualizing the Twentieth Century,” American Historical Review, December 2016 and is the author of “Gender Binary and the Limits of Poststructuralist Method,” Gender and History, August 2016; “Bolshevik Feminism and Gender Agendas of Communism,” in Silvio Pons and Stephen Smith, eds., World Revolution and Socialism in One Country (Cambridge University Press, forthcoming, 2017); and “Soviet Modernity: Stephen Kotkin and the Bolshevik Predicament,” Contemporary European History, May 2014. She has been Fellow at the National Humanities Center; George Kennan Member at the Institute for Advanced Study, Princeton; Fellow at Davis Center for Russian and Eurasian Studies at Harvard University, and visiting scholar at the Institute of Eastern European History at Tubingen University (Germany). Her work has been supported by the Mellon Faculty Book Manuscript Workshop Fellowship, SSRC, and IREX. Ph.D., History, 2001, Johns Hopkins University. M.A., History, 1998, Johns Hopkins University. M.A., Political Science, 1995, Johns Hopkins University. Fellow, National Humanities Center, 2013-2014. Member, School of Historical Studies, Institute for Advanced Study, Spring Term, 2013. 2011 Herbert Baxter Adams Prize of the American Historical Association, awarded for the best first book in European history. 2008-2009 Mellon Faculty Book Manuscript Workshop Fellowship, John Hope Franklin Humanities Institute, Duke University. 2006-2010 Hunt Family Assistant Professor of History, Duke University. 2005-2002 Post-Doctoral Fellowship, Davis Center for Russian and Eurasian Studies, Harvard University. 1998-1999 Social Science Research Council Dissertation Write-up Grant. 1999 Stulman Graduate Student, Department of History, Johns Hopkins University. 1997-1998 IREX Individual Advanced Research Opportunities Fellowship. 1997-1998 Pre-Dissertation Fellowship Award, Association for Women in Slavic Studies. Anna Krylova works on twentieth-century Russia and the challenges posed in envisioning and building a socialist alternative in the age of industrial and post-industrial modernity and globalization. Questions of historical theory, gender theory, and practice in contemporary historical writing propel her work, with a special focus on methodological and historiographical problematics in gender history and Western scholarship on the Soviet Union. She is the author of Soviet Women in Combat: A History of Violence on the Eastern Front (Cambridge University Press, 2010) which was awarded the 2011 Herbert Baxter Adams Prize of the American Historical Association. Her current interests lie in gender theory and methodology, more specifically, in the critical interrogation of the theorization and making of the gender category since the 1970s. She is preparing a collected volume, The Practice of History in the Twenty-First Century, featuring essays accessing of what has happened to the practice of history after the theoretical and epistemological turmoil of the 1980s-1990s. Her new book project, “Socialist Imaginaries of the Soviet Century,” engages the current academic and popular conversation about social justice, economic responsibility, and individual self-realization in modern industrial societies that has been informed by an explicit and implicit comparison between capitalist and socialist modernities of the 20th century. This conversation has been dependent on historical analysis of Soviet socialism which has been worked out largely in relation to the Soviet Union’s experience with Stalinism and its two preceding decades. This book project aims at disrupting the dominant vision of Soviet socialism as conceptually reducible to the first half of the 20th century. It aims to make possible a new cultural history of Soviet Russia by historicizing the ways in which normative conceptions of socialist society, sociality and self evolved in Russia and the Soviet Union from the First Russian Revolution into the postwar and post-Stalinist years.